In a previous post, we looked at how I create quizzes based on the grading scale I stole from Niles New Tech. Be sure to read that post first before going through this one. Here, we’ll take an in-depth look at a recently graded quiz. To start, let’s see the grading scale again. When grading quizzes, the goal is to gain a holistic picture of student understanding (using the descriptors in the scale above) based on the work and explanations given. In order to help with this process, I give a proficient, advanced, and mastery level question for each concept being assessed on the quiz. This provides a solid framework to analyze student thinking and also helps make the process more black and white. In theory, a student’s grade will turn out like this. 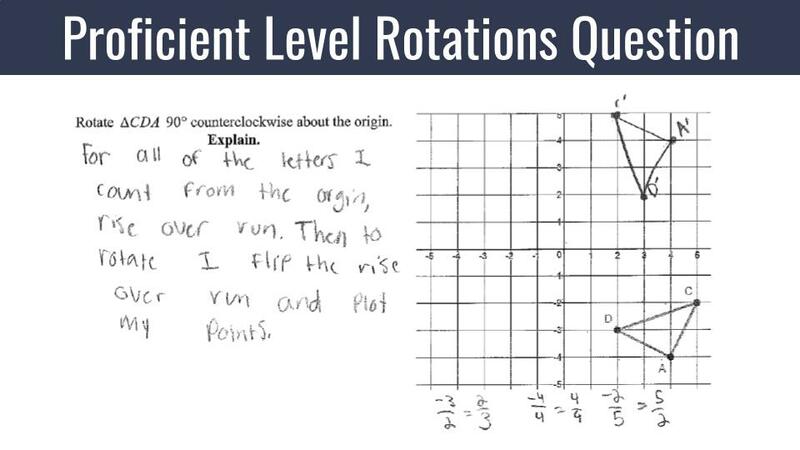 Student gets the proficient level question correct with a solid explanation. However, the student does not show enough understanding of the advanced and mastery level questions. Therefore, this student receives an 8. Student gets the proficient and advanced level questions correct with solid explanations. However, the student does not show enough understanding of the mastery level question. Therefore, this student receives a 9. Student gets the proficient, advanced and mastery level questions correct with solid explanations. Therefore, this student receives a 10. However, it doesn’t always work that smoothly, so there will inevitably be teacher discretion in the grading process. What if a student misses all the questions? What if a student gets the advanced level question correct but misses the proficient and mastery level questions? At the end of the day, that final decision comes down to what the student shows and your professional opinion. The rest of this post will give some insight into my thinking during the grading process. We’re about to look at actual student work samples. Here are materials to help guide the process. 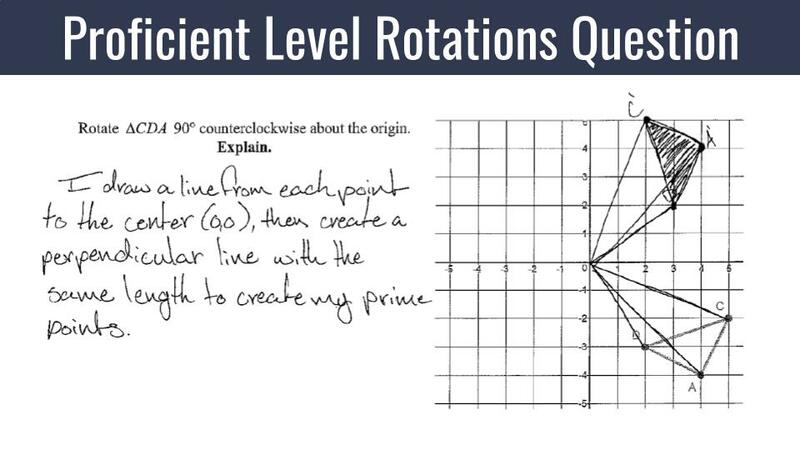 For the student work samples below, we’ll look at the grading for the Rotations portion of the quiz. The same process is used to also give a Dilations and Compositions of Transformations grade, but we’ll focus on only one concept for this post to keep it shorter. Level 10 samples are pretty straightforward. The student got every question correct, and the explanations make sense and are easy to follow. 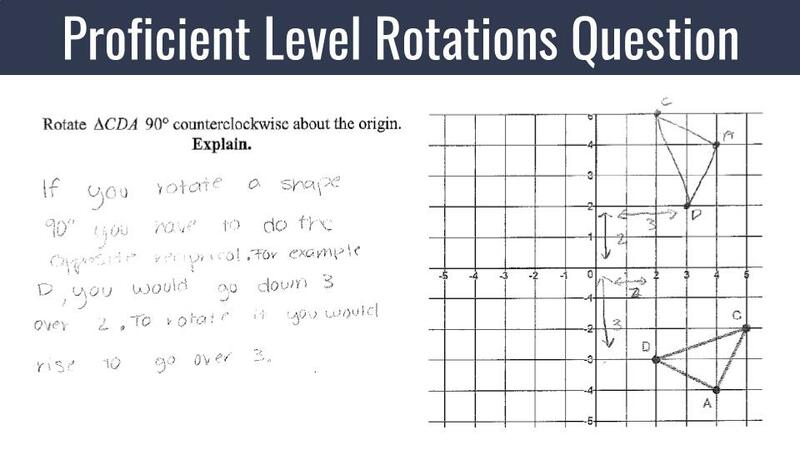 It’s clear that this student has conceptual and procedural understanding of rotations. In addition, since the questions have a good range of difficulty, I’m confident in presenting this student to parents and administration as a mastery level student. There’s enough body of evidence to make that claim. 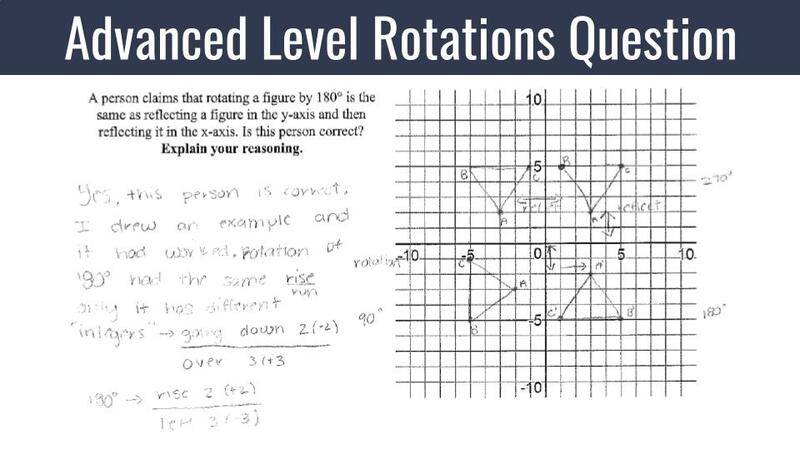 This student was rated as advanced (9) because she got both the proficient and advanced level rotation questions correct. In addition, her explanations were clear and made sense. She did not receive a 10 because she chose not to attempt the optional, mastery level rotations question. This student will have the chance to receive a 10 by retaking the rotations portion of the quiz and scoring advanced (9) for a second time. This student was rated as proficient (8) because the proficient level question is correct and sufficient work and explanation is provided. Although the advanced level question is correct, I did not feel like the explanation was enough to show that the student truly has advanced understanding. For one, no graph was drawn to help illustrate thinking. In addition, the explanation isn’t specific enough to show that this wasn’t just a guess. However, this student is welcome to come to me later and provide a better explanation in person to demonstrate understanding. I’m happy to reward an appeal, but based on the given sample at this moment, I can’t fully place this student in the advanced category. 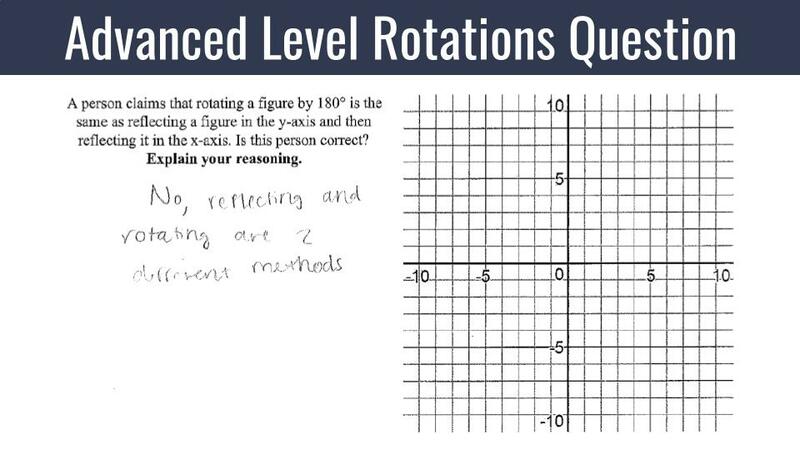 This student was rated as emerging (7) because even though none of the questions are correct, there is evidence that she is very close to proficient understanding of rotations. 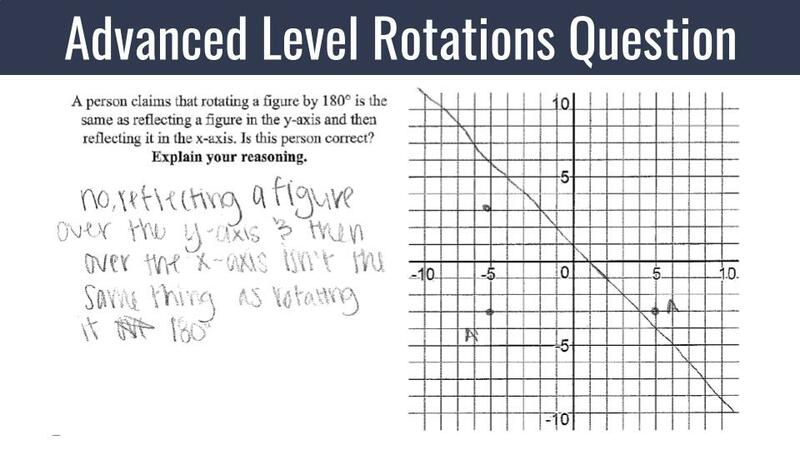 For example, in the proficient level question, her work showing the attempt to create opposite reciprocal slopes was helpful for me to see that she has a good idea about how to approach the problem. At this point, it seems she pretty much knows what to do but just needs a little more time to build her procedural fluency. 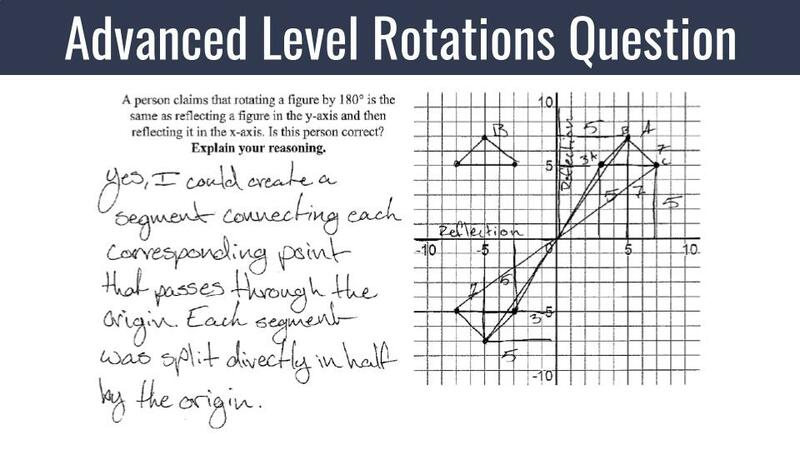 This work sample is one of my favorites because I can see specific areas that can be targeted to help this student reach the next level of understanding. Her errors are pretty clear, and this will allow us to have an easier time working together to improve. 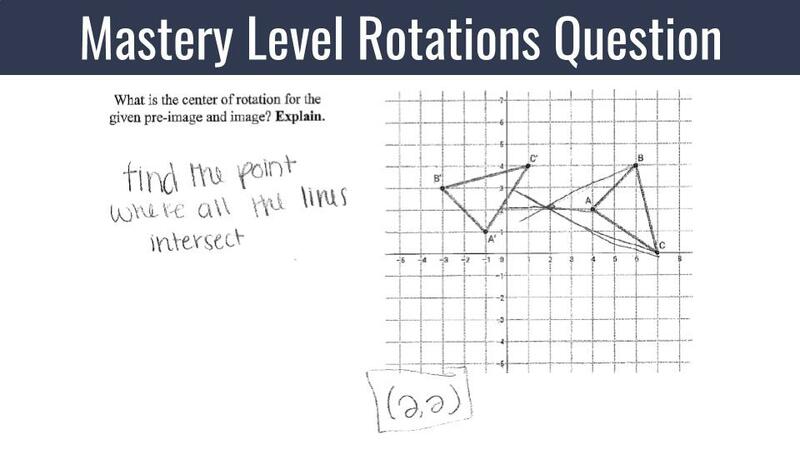 This student was rated as “not yet” (6) because both questions are incorrect, and there is not enough evidence that this student is in the emerging category. For example, the student did not show an attempt to find the slope from the origin to the original triangle. 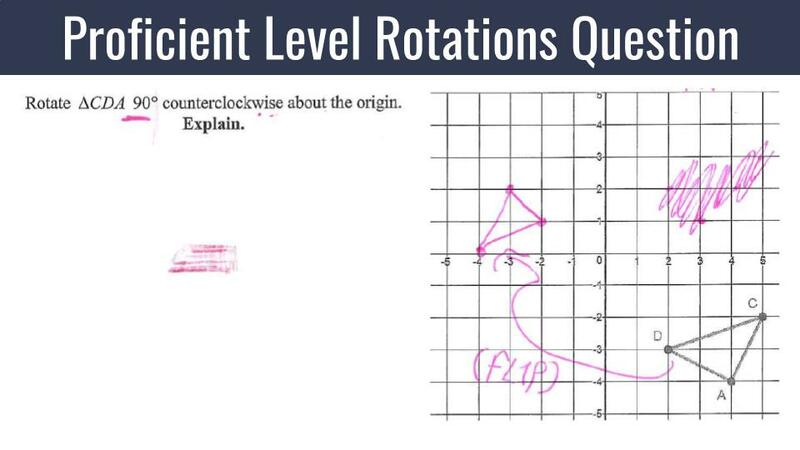 In addition, there was no attempt or demonstration that he knew perpendicular slopes are needed (we learned about rotations based on perpendicular slopes instead of using coordinate rules). However, I did like this student’s attempt, and I believe he provided enough evidence for assessment instead of just flat out guessing or not trying. 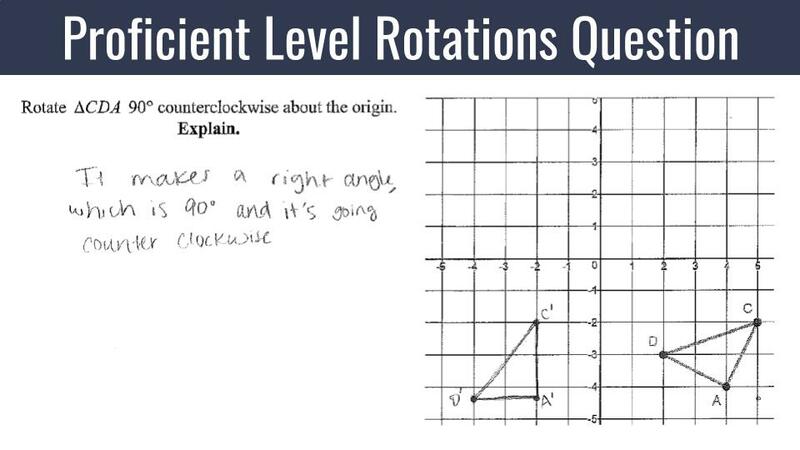 I can tell that this student is thinking in a positive direction about what a rotation is. At this time though, he is not there yet with his execution and understanding. \This student was rated as “incomplete” (5) because the work sample matches the above descriptor. 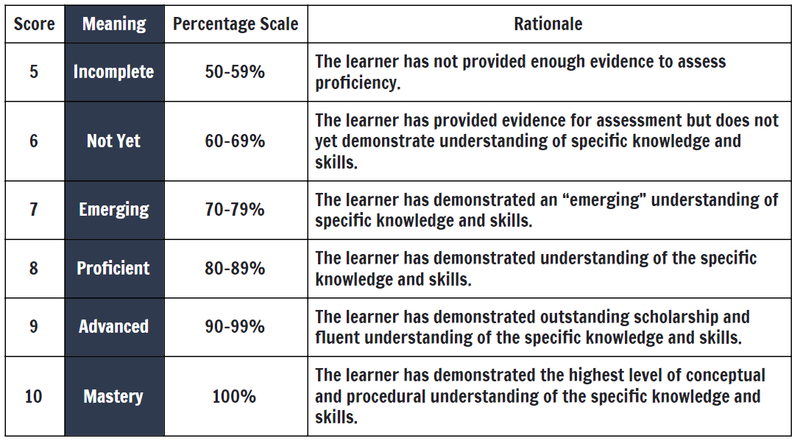 There isn’t enough evidence to assess proficiency. The proficient level question doesn’t show enough to demonstrate that this student is thinking about 90° angles or perpendicular slopes. In addition, the advanced level question doesn’t provide evidence that he didn’t simply guess. At this time, I can’t find enough to work with to put him in the “not yet” (6) category. 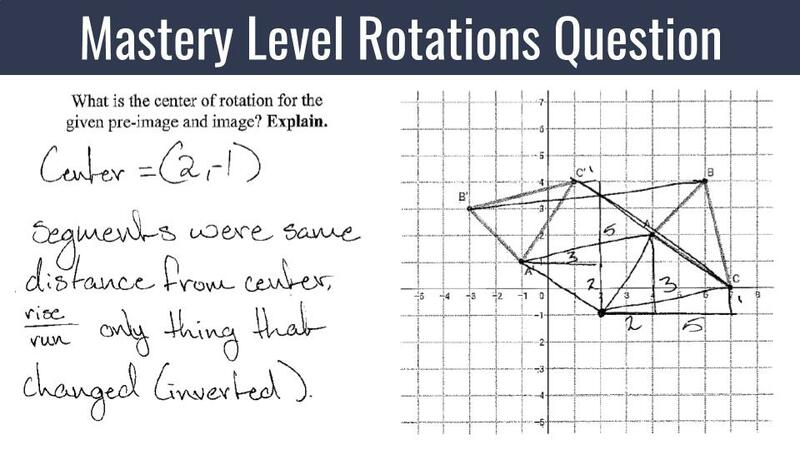 Note: this work sample isn’t from the rotations portion of the quiz. Instead, it’s from the dilations section. I chose this one because it provides a good example of a common situation a teacher is put in when grading in a SBG system. There will inevitably be moments where teacher discretion is needed to correctly and fairly rate a student. This student was rated as “emerging” but given a 7.5 instead of a 7 because she is really, really close to demonstrating proficiency. First, her proficient level question was just slightly off. We learned how to dilate figures by finding the slope from the center point to each given point on the pre-image. From there, we multiply the “rise” and “run” by the scale factor to find the slope to the new image. This student found those new slopes pretty much perfectly. However, she went the opposite direction on the graph. So, her answer is just a reflection of the correct answer. This was a big piece in my decision to bump up the rating to 7.5. I can’t justify a full “proficient” rating, but a flat 7 just didn’t feel like a fair mark for this student’s understanding. Her error can be corrected quickly, and she may already be able to knock out a bunch of other proficient level questions based on what I’m seeing here. 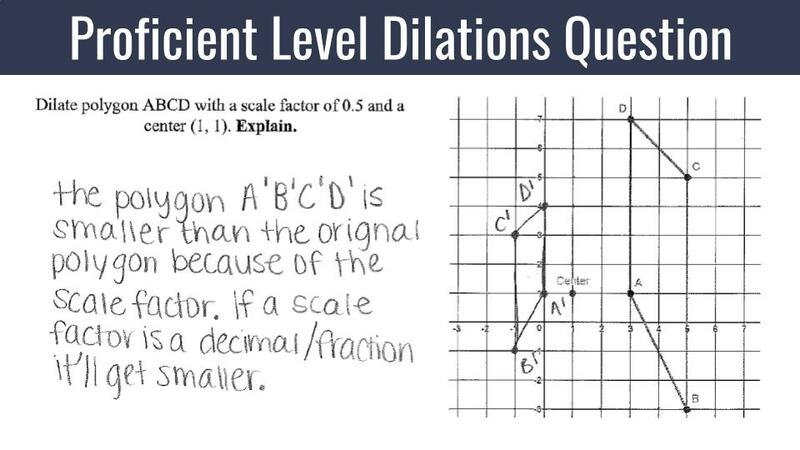 In addition, the student didn’t get the advanced level question correct, but her graph that she created shows a perfect -1 dilation with a center at the origin. This was an extra boost to my opinion that she’s too close to proficient to receive a flat 7. Are there specific words to look for in student explanations? 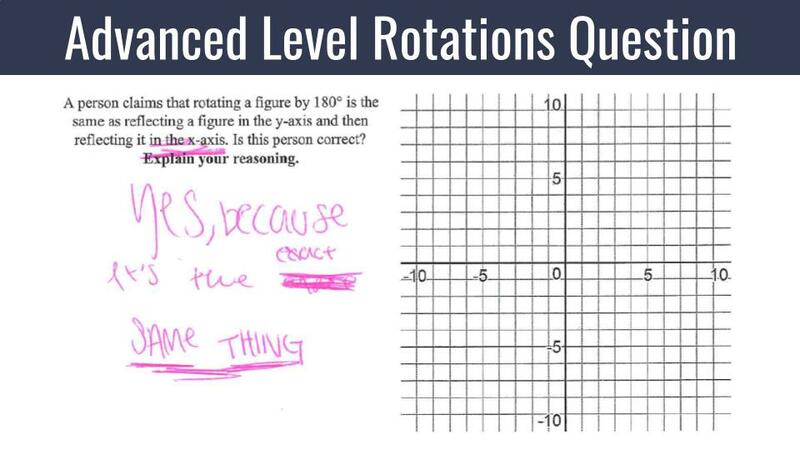 The main thing I look for with student explanations is that they seem to know what they’re doing and they can explain enough to show they’re not just guessing or cheating. Explanations are many times just a confirmation of student understanding. In addition, I also look to explanations when I’m on the fence about what rating to give. As for specific words, it depends on the way the concept is being taught in your classroom. For example, as mentioned above, I taught rotations from a perpendicular lines perspective instead of using coordinate rules. 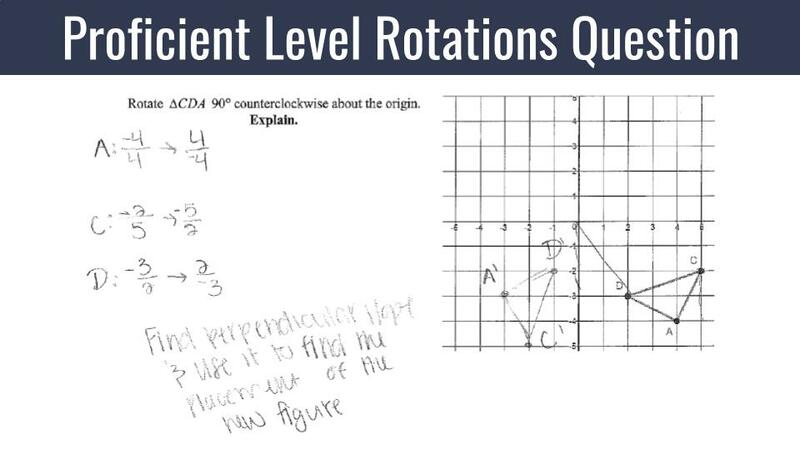 Therefore, it was helpful for me to see something about perpendicular slopes in student work and explanations. However, it wasn’t an automatic level drop if I didn’t specifically see those words in their. 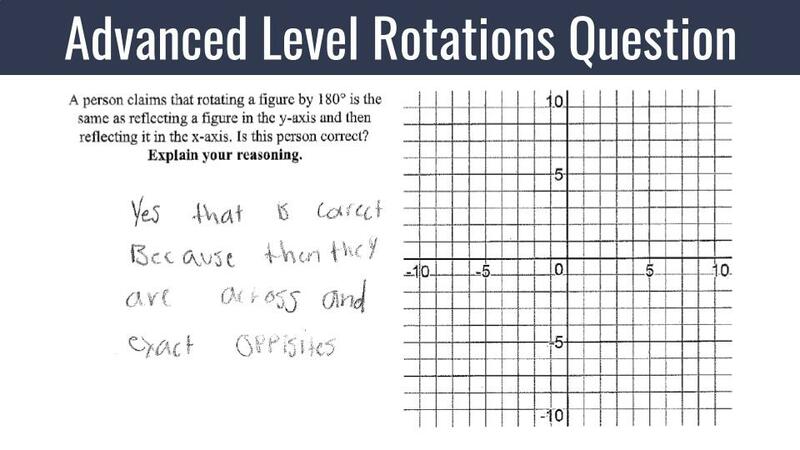 In turn, if I taught rotations mainly by using coordinate rules, then I’d look for evidence of understanding the rules we used in class. Again, the explanation is more of a confirmation / help to see what level of learning a student is at. What does the gradebook look like? What exactly is the level of involvement regarding teacher discretion? Teacher discretion comes in when students don’t get all the 80 level questions right, or all the 90s, etc. Ideally, a student may get all the 80 levels right, for example, but miss the 90s and 100 level resulting in the student receiving an 80 as their grade. However, in many situations, the student will get some of the 80 levels right, or some other combination, and it’s up to the teacher to determine what level the student is at. It all comes back to the rating scale. The teacher is trying to determine which category the student falls into. 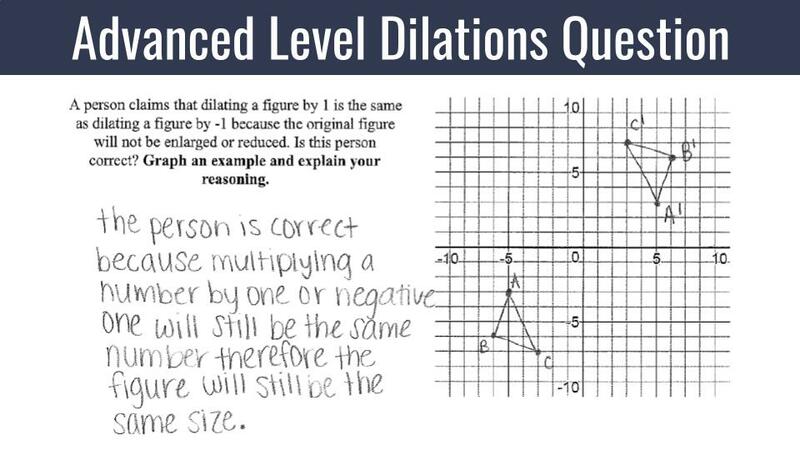 So, based on the evidence a student has shown (work shown and written explanations), a teacher determines what rating a student is. If a student is close to getting all the 80s right, but has a small error or two, then he or she may receive a 70 or 75 (emerging category). If the student isn’t as close, then he or she will probably be a 60 or 65 rating (not yet category). When grading quizzes, it’s actually easier to determine grades than it may sound. Levels tend to form as a teacher grades one paper to the next. The teacher starts to see patterns in mistakes and gives consistent grades based on the patterns he or she notices. Really, the first class of the day is probably the most important, because that class is setting the standard for what ratings are given for the rest of the classes.